Jean-Francois Millet, a founding father of the Barbizon School of Art during the middle 1800s in France, is best known for his treatment of the everyday life of French peasant farmers - putting together, for the first time, rural landscapes that also included people as subjects. Jean-Francois Millet’s artwork, although sometimes criticized and maligned at the time, became quite popular. Millet himself was even made a member of the Paris Salon Jury, a group that had previously rejected more than one work of Millet art. We've obtained a number of high quality Jean-Francois Millet etchings that have been produced by various artists after the Millet paintings. These Millet prints are wonderful examples of Millet works, faithfully executed by artists including Delauney, E. Bolvin, Charles Courtry, La Guillermie and Edmond Hédouin. Jean-Francois Millet etching "La cueillette des haricots"
Medium: etching (etched by Edmond Hedouin after the Jean-Francois Millet painting). Catalogue reference: Beraldi 39. Published in 1875 in Paris by L'Art and printed on japon paper, and tipped (lightly mounted along the top by the publisher onto a sheet of Bristol board). The image measures 8 x 6 1/2 inches (205 x 165mm). Not signed. This state (before letters and on japon) is far more rare than the final published edition. Condition: In very good condition, with a bit of rippling near the top right corner where the etching is tipped onto the support sheet. Jean-Francois Millet etching "Shepherd Tending his Flock"
Medium: etching (after the painting). Etched by French artist Frederic Auguste Laguillermie after the Millet painting. Published in Paris in 1873 by the Galerie Durand-Ruel for the rare "Recueil D'Estampes Gravees a L'Eau-Forte" portfolio. This impression is on cream laid paper and the plate size is 4 3/4 x 6 inches (120 x 150 mm). In good condition with good margins; there is a platemark but it is not shown here in this photo. Plate-signed, not hand-signed. Medium: etching. Etched by Ed. 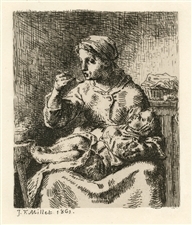 Hedouin after Jean-Francois Millet and published in 1890 in an edition of 200. This is a nice impression printed on a japon-style paper. The image measures 5 3/8 x 3 1/4 inches (135 x 85 mm). Plate-signed, not hand-signed. Medium: etching. Etched by C. Bertaut after Jean-Francois Millet and published in 1890 in an edition of 200. This is a nice impression printed on a japon-style paper. The image measures 4 1/2 x 6 1/4 inches (115 x 157 mm). Plate-signed, not hand-signed. Jean-Francois Millet etching "La recolte du sarrasin"
(The Buckwheat Harvest) Medium: etching (after the Jean-Francois Millet painting). Etched by French artist Charles Courtry (1846-1897) after Millet. This is a good impression on laid paper. Printed by A. Salmon and published in Paris 1875 by Gazette des Beaux-Arts. Image size: 5 1/2 x 7 inches (140 x 180mm). Not signed. Condition: there is wear to the edges of the sheet, including two small repaired tears to the bottom of the sheet, in the margin and not affecting the etching (see the second photo). 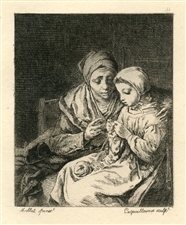 Medium: etching (etched by Edmond Hedouin after the Jean-Francois Millet painting). Catalogue reference: Beraldi 39. Published in 1875 in Paris by L'Art and printed on watermarked laid paper. 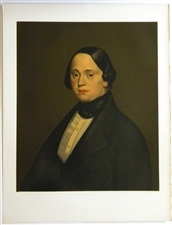 The image measures 8 x 6 1/2 inches (205 x 165mm). Not signed. Jean-Francois Millet lithograph "Jeune femme en buste"
Medium: lithograph (after the Jean-Francois Millet painting). This exquisite lithograph on quality Arches paper was printed in Paris at the Mourlot studio in 1973 in an edition of 1000 for the Collection Pierre Lévy deluxe portfolio. The image measures 16 x 12 3/4 inches (400 x 323 mm) and the full sheet is 26 x 20 inches. Not signed. 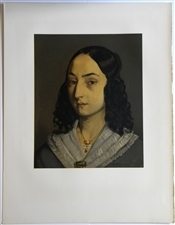 Jean-Francois Millet lithograph "Portrait of M. Fournerie"
Medium: lithograph (after the Jean-Francois Millet painting). This exquisite lithograph on quality Arches paper was printed in Paris at the Mourlot studio in 1973 in an edition of 1000 for the Collection Pierre Lévy deluxe portfolio. The image measures 20 x 16 1/2 inches (504 x 424 mm) and the full sheet is 26 x 20 inches. Not signed. Medium: etching (after the painting). Etched by French artist Frederic Auguste Laguillermie after the Millet painting. Published in Paris in 1873 by the Galerie Durand-Ruel for the rare "Recueil D'Estampes Gravees a L'Eau-Forte" portfolio. This impression is on cream laid paper and the plate size is 6 x 5 inches (153 x 125 mm). In good condition with good margins; there is a platemark but it is not shown here in this photo. Plate-signed, not hand-signed. Medium: etching (after the painting). Etched by French artist Charles Courtry after the Millet painting. Published in Paris in 1873 by the Galerie Durand-Ruel for the rare "Recueil D'Estampes Gravees a L'Eau-Forte" portfolio. This impression is on cream laid paper and the plate size is 4 1/2 x 6 3/8 inches (112 x 163 mm). In good condition with good margins; there is a platemark but it is not shown here in this photo. Not signed. 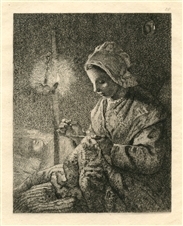 Jean-Francois Millet etching "Femme cousant"
Medium: etching (after the painting). Etched by a French engraver after the Millet painting. Published in Paris in 1873 by the Galerie Durand-Ruel for the rare "Recueil D'Estampes Gravees a L'Eau-Forte" portfolio. This impression is on cream laid paper and the plate size is 6 x 4 3/4 inches (150 x 120 mm). In good condition with good margins; there is a platemark but it is not shown here in this photo. Not signed. Jean-Francois Millet etching "Gardeuse d'Oies"
Medium: etching. Etched by E. Bolvin after Jean-Francois Millet and published in 1890 in an edition of 200. This is a nice impression printed on a japon-style paper. The image measures 4 1/4 x 5 inches (110 x 130 mm). Plate-signed, not hand-signed. Jean-Francois Millet etching "Le Retour des Champs"
Medium: etching (after the painting). Etched by Vion after Millet. This impression is from the rare 1897 portfolio "Art et Nature" by Leon Roger-Miles, published in Paris by Boudet in an edition of 525. Printed on Marais wove paper, the image size is 5 x 7 inches (121 x 180 mm). Signed in the plate, not by hand. Medium: etching (after the painting). Etched by Martinez after the Millet painting. Published in Paris in 1873 by the Galerie Durand-Ruel for the rare "Recueil D'Estampes Gravees a L'Eau-Forte" portfolio. This impression is on cream laid paper and the plate size is 5 1/4 x 6 3/4 inches (135 x 170 mm). In good condition with good margins; there is a platemark but it is not shown here in this photo. Plate-signed, not hand-signed. Medium: etching (after the painting). Etched by Flameng after the Millet painting. Published in Paris in 1873 by the Galerie Durand-Ruel for the rare "Recueil D'Estampes Gravees a L'Eau-Forte" portfolio. This impression is on cream laid paper and the plate size is 5 1/2 x 3 1/4 inches (140 x 85 mm). In good condition with good margins; there is a platemark but it is not shown here in this photo. Plate-signed, not hand-signed.